You can add a personal touch your jewelry designs when you learn how to make glass beads. Although the materials and skills required for this craft can make it seem intimidating, anyone can learn to make glass lampwork beads at home. There are also simple variations that don't require any special supplies. If you've been making jewelry for a while, you've probably noticed that there are several different types of glass beads on the market. Most of the beads you see in craft stores have been molded, which means that molten glass is poured into a mold and allowed to harden. You may also see kiln-heated glass beads, which are sometimes created from special glass clays and fired at high temperatures. Neither of these methods are particularly easy for the home crafter. However, with a few tools, you can create your own lampwork beads. 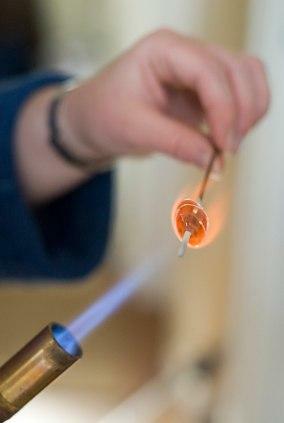 To make a lampwork bead, the crafter holds a narrow glass rod over a superheated flame until the glass begins to melt. Then the lampworker carefully turns the glass around a specially prepared rod, called a mandrel. The molten glass is very flexible, and the artisan can use graphite or wood tools to change its shape. Finally, the crafter applies other colors of melted glass to create pretty designs. Many crafters enjoy creating unique lampwork bead designs. There are dozens of books on the topic of making your own glass beads, and you can buy lampwork bead kits that include the tools and supplies you'll need to get started. A basic lampwork kit includes a torch, glass rods, a mandrel, and instructions. Kits typically cost about $100. If you're not quite ready to learn lampworking, consider trying this fun project. You don't need to worry about heat or molten glass, and you don't need to invest in a lot of supplies and equipment. To get started, place the flat glass marble on top of the scrapbook paper. Trace around it with the pencil. Move the marble, and trace it again. You'll have two rough circles drawn on the paper. Use the scissors to cut out the circles. Set them aside. Cut a piece of wire about two and a half inches long. With the pliers, make wire-wrapped loops on either side of the wire. Set this aside. Mix the epoxy. When using epoxy, always be sure to work in a well-ventilated area. Use the plastic knife to spread the epoxy on the back of the glass marble. Once it is evenly coated, press one of the scrapbook paper circles into the epoxy with the patterned side down. Turn the marble over. Continue pressing the paper until you can clearly see the pattern through the marble. Allow the paper to dry for a few minutes, and then spread another layer of epoxy on the back side. Gently place the wire across the back of the marble, allowing the looped ends to stick out on either side. Apply a little more epoxy over the wire, and then press the other circle of scrapbook paper on top. This time, the pattern should be facing up. Once the paper has dried for a few minutes, apply another layer of epoxy to seal it. Allow the bead to dry for 24 hours before using it in your jewelry designs. Now that you know how to make glass beads, you can decide which method works best for your needs. Whether you choose to make lampwork beads or use the instructions here, you can create one-of-a-kind gems that will enhance all of your jewelry creations.